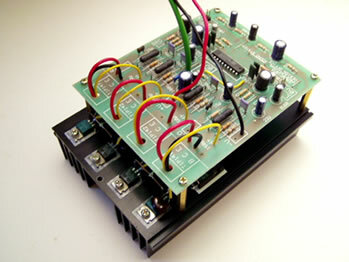 This 2-channel hybrid IC is normally configured with TIP142/147 power darlingtons for its' output. For those who prefer to use power transistors instead, the TDA7250 can easily be converted. All that is required are a few transistors, 4 additional resistors and some rewiring. This conversion centers mainly on changing the output section to a Sziklai. In our IA502 on the right, drivers Q1,Q2 are 2SC2238 and 2SA968, and outputs Q5,Q6 are 2SA1216 and 2SC2922 respectively. No instability problems were encountered from this conversion. After a period of run-in, the amplifier remained thermally stable. Is this version worth the extra cost and effort? If one is only interested in something basic, the TIP version would be sufficient. But if one is after sonic performance, I would recommend this version.